On January 22, James Bell took his Advanced Chemistry class and fellow science teacher Chelsea Zaniboni to the Hawai’i Institute of Marine Biology (HIMB) facility on Moku o Lo’e, better known as “Coconut Island,” for some hands-on learning. The Island, situated in Kaneohe Bay, support a rich and diverse marine environment, making for a dynamic arena for research and scientific discovery. 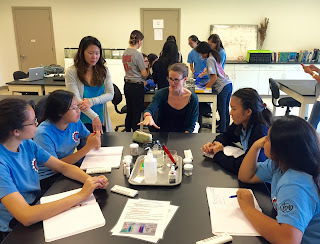 The students focused on learning more about the chemistry behind ocean acidification, the process by which carbon dioxide is absorbed by seawater, resulting in various chemical reactions. While much of their day was Science inquiry takes class to Coconut Island spent in the classroom environment with the HIMB staff, the group had the opportunity to explore part of the Island’s 29 acres, including visiting one of the six acres of adjacent lagoons – this one housing the shark pond!